There are some people who will tell you to ignore McDonald’s Treasure Land Adventure, because it’s connected to McDonald’s. Ignore these crazy people and force feed them french fries until they see the error of their ways. While this is based on the exploits of a fast food clown, there’s nothing poor or unhealthy about this fantastic little platformer. The main reason for this is because it’s by Treasure, you know, the guys who did Gunstar Heroes, Ikaruga and the amazing Sin & Punishment. Treasure knows how to make games with interesting gameplay mechanics, so when you see Treasure on the box, you don’t question the quality and worry about its origins, you just play it and enjoy it. McDonald’s Treasure Land Adventure is no different, being a classy platformer with fun (if not amazingly innovative game mechanics) and beautiful looking visuals. 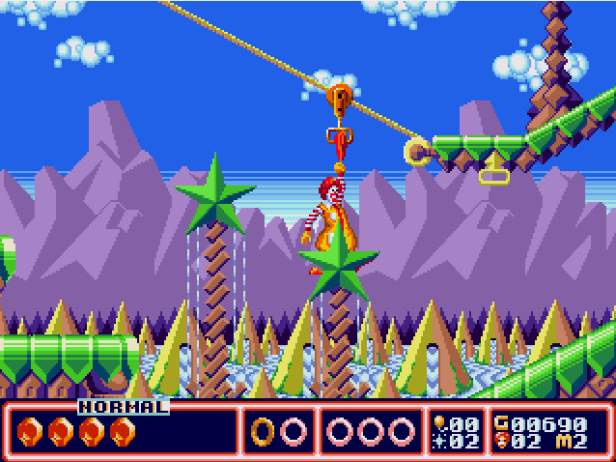 Ronald gets around with a handy umbrella, and he can also use magic dust to stun or kill enemies. This is handy, as there are some rock hard bosses in the game that can take a surprising amount of effort to beat. It’s not the best game in Treasure’s library, but it is very entertaining and just about worth the high eBay prices that it currently sells for. If you’re looking for an unconventional platformer then give it a whirl. You won’t be disappointed.